PRIVATE RETREAT...POOL HOME...Your own park like setting.A spectacular 4.8 acre parcel laced in ancient oaks and lushly landscaped with a meandering driveway from the gated entry to a circular driveway with a bridge over seasonal stream that approaches the massive eight foot wrought iron doors. French doors open to a large deck area with Mangaris wood deck where you sit among the oaks and overlook the newer lavish pool area which includes fireplace, fire pit, outdoor kitchen and waterfall. The upper level consists of three bedrooms, gourmet kitchen with American cherry wood cabinetry, upscale stainless appliances and a 72" refrigerator/freezer, sit up bar and more formal dining area with built ins. The living room encompasses a custom hand carved wood mantle. View are spectacular from the over sized windows. The lower level includes a second master with two additional bedrooms, a theater room and huge bonus room with kitchenette and a second laundry room. The floors are Brazilian cherry hardwood, crown molding is throughout, built in desk, granite and travertine adorn the home. The garage is an extra large four car with storage. The land offers a couple of options for horses with direct trail access. 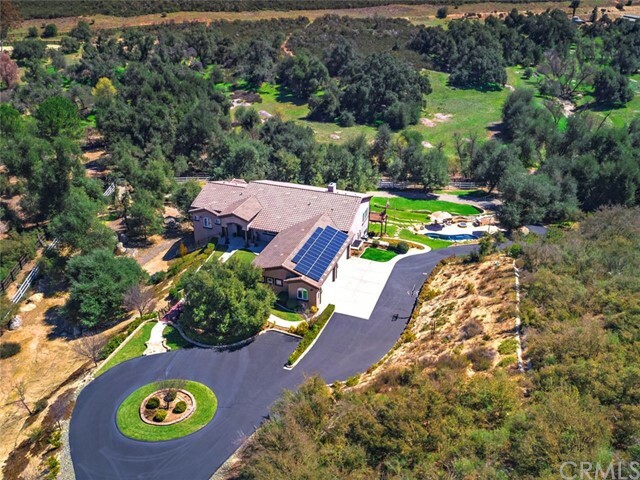 This home is on well with a 2500 gallon storage tank and solar that is a pre paid solar package worth $50,000. This property is move in ready!